Lion Andrew Lawson presents a £250 cheque to Helena Jones for Tesco's charity fund 2016 - The British Heart Foundation and Diabetes UK (Left) and a £50 cheque to Emma Jane Taylor for Ilminster's Party in the Park (Right). 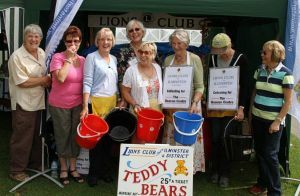 We raise money with our Teddy Bear stall at several events around the area, often with the help of members' partners and friends. We also do well from donations at the Mulled Wine stall at the Victorian Evening in November when the Ilminster Christmas Lights are switched on. 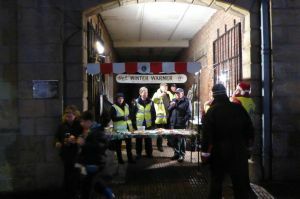 Here is the Winter Warmer Grotto at the Market Square. We support the Taunton Flower Show often by raising money for a signature project such as equipment for the Neonatal Intensive Care Unit at Musgrove Park Hospital, Taunton. 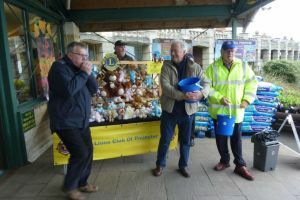 The Ilminster Lions President Alan Rudkin and Lion Dave Case present a cheque for £1,000 to Dr Chris Knight from the Unit. 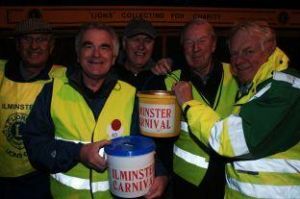 We also help the South Petherton and Ilminster Carnivals by collecting money in buckets for the carnival organisers. 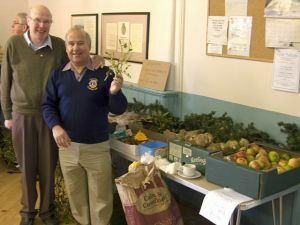 Once a year in December we decamp to South Petherton for our Christmas Bazaar in the Blake Hall - Lions Roger Taylor and Dave Case use their charm to sell mistletoe - will it work? We also support other good causes, like the Royal Oak at Over Stratton Christmas Carol sing song or collecting for Marie Curie Cancer Care outside a local supermarket (wearing silly hats! - see below). 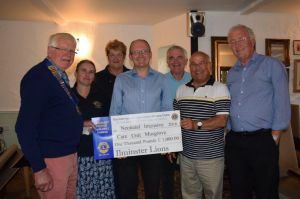 Lion Nigel Clymow presents a cheque to Horseshoes and Handprints, a charity based at Stocklinch near Ilminster. They provide equine-assisted sensory therapy and special riding for adults and children with Aspergers, autism, neurological disorders or suffering with behavioural difficulties.